Stunning Ko Phi Phi Don is the heart of the island whose natural beauty runs to mountain ranges, cliffs, idyllic beaches and coral reefs. As a tourist destination with resorts along the southern and eastern beachfronts and with the main village of Ko Phi Phi Don at the pier, it provides a wide variety of low rise accommodation with a restaurant, bar, cafe, culture as well as a huge variety of dive schools and water based tour opportunities. Ko Phi Phi Don is the big brother of the Ko Phi Phi archipelago and is the largest of 6 islands and rocky outcrops. Originally settled by the Muslim fishing, coconut and cashew nut farming families from Koh Yao, Krabi and Koh Lanta it was a simple and yet tight community until the 1990s. After Leonardo Di Caprio's Movie "The Beach" was filmed on Maya Bay Phi Phi became famous overnight. Ko Phi Phi Don is 6 km long and 2.5 km wide but 90% is either mountainous cliff of rugged hillside ensuring that all resorts are pushed down to the water’s edge. The main Ko Phi Phi Don village of Tonsai straddles Tonsai Bay and Loh Dalum creating the iconic 2 bay picture from Viewpoint. Ko Phi Phi Don has some of the islands best kept secrets as the day trippers head over to Maya Bay, the inlets and reefs of Phi Phi Ley. Yet in the quieter bays of Ko Phi Phi Don like Wang Long, Monkey Beach, Nui Bay and Lanah bay there are some enchanting locations to stop and take in paradise. The sand is a fine golden yellow, the pristine jungle plunges down the cliffs, the setting pure perfection. Diving on Ko Phi Phi Don is often talking about the dive schools and the main pier that has a large section for divers. Most of the dive schools are down by the pier to get to their boats as well as to the bay in front of Phi Phi Island Cabana Hotel. Here the divers learn their art in the confined water before finishing their skills in the open water in the reefs off Phi Phi Ley. Some of the islands best dive sites can be found like Hin Dot and the walls on the west side of Ko Phi Phi Don as well as up round Nui Bay. The best Ko Phi Phi Don resorts can be found on the eastern edge of the island. This 4 and 5 star luxury accommodation has all that is needed for the discerning traveller. 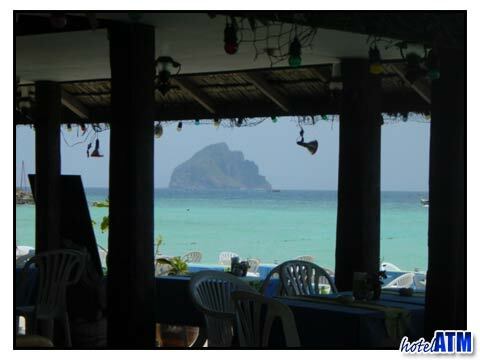 Budget beachfront resorts can be found all around the Ko Phi Phi Don Village, Long beach and Pak Nam Beach. Ko Phi Phi Hotels are centred around the main pier and have good value. Phi Phi Palmtree, Phi Phi Hotel, Andaman Beach Resort and PP Andaman Legacy have hotel accommodation. There are many simple guesthouses inside the main village and these cater to the large number of traveller and backpackers that arrive in low season to see the sights and party. Modest and unassuming they provide a perfect counter to the high end accommodation and ensure that there is an eclectic mix of tourists throughout the year. Here are 3 useful links to Ko Phi Phi Don. The best of Phi Phi and top 10 things to do are great links to work out what to do while you are on the island. They give a full scope of the possibilities which are many. The Siam UK Travel and Tours link takes you to one of the top businesses on the island for arranging all the water based activities and also organise island hopping onward travel.